I have been working like CRAZY lately… if it isn’t report cards it’s some sort of parent meeting or team brainstorming session about writing next trimester. I know, wah, wah, wah… But my point is, I haven’t even had a minute to think about Istanbul and I leave this Saturday. Me, Miss Make a List and Check it Twice traveler doesn’t even know what she will wear on the plane (which is something more people should consider, college hoodies or sweats with ‘Juicy’ on the rear don’t count as travel wear – I don’t care how many hours you are in the air – we all have to look at you). I digress. Like I was saying… my hours working are looooong, and the other day, I left the small, top, most important piece because it’s what plugs into the wall to charge the computer part of my charger in the extension cord at my favorite coffee place while writing the above mentioned report cards. Now I am not sure if you are aware, but Apple rarely gives any sort of discount. I remember when they used to package the chargers with the iPods and now they sell them separately… so when I, meaning my Chinese speaking TA, called the cafe the next morning and they said they had it (smile), but then I went in that afternoon and they said they didn’t have it (frown), I wasn’t looking forward to buying a new charger in Hong Kong. I thought it would set me back about $40US. I wish. I get to the new Apple store and it turns out they charge $588HK – that’s about $100US for the small, top, most important piece because it’s what plugs into the wall to charge the computer part of my charger. Ugh. But then a miracle! 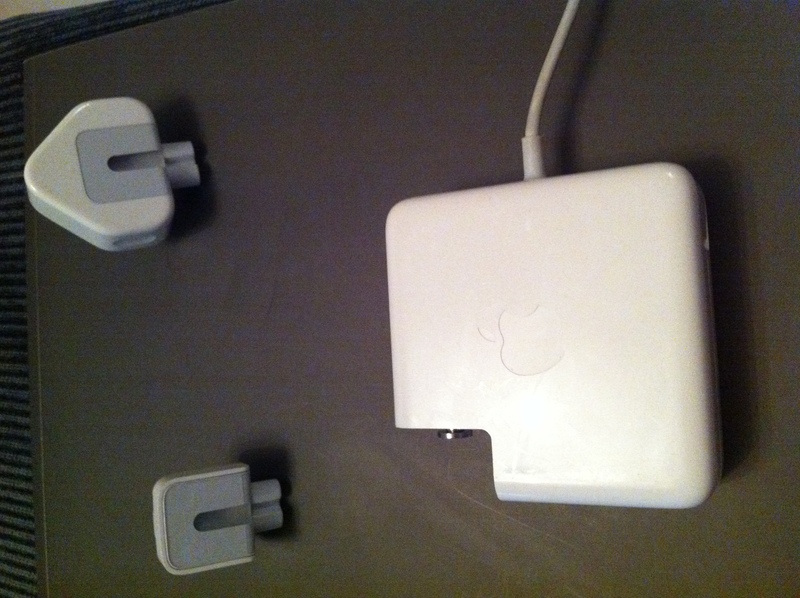 The guy at the Apple store actually gives me the Hong Kong version of said piece – for free! Although I live on main land China, my landlord has Hong Kong style outlets in the apartment. I know, it’s complicated but at least I can charge it at home now. So today as I am walking home from my other favorite coffee house, one of the waiters at the place I lost the adapter runs outside and hands me my original, small, top, most important piece because it’s what plugs into the wall to charge the computer part of my charger. I swear I almost hugged him! Another miracle! Look, it may not seem like one to you, but man, I was thanking everyone at that moment. I could have danced home! Sometimes, China just surprises me in the best ways. What a nice story — gives you hope that there are a lot of good guys still out in the world!!! Good karma for you, Claire. Well deserved. Good luck on your travels and I loved your comment about travel dress! So true!